Happy March loves! 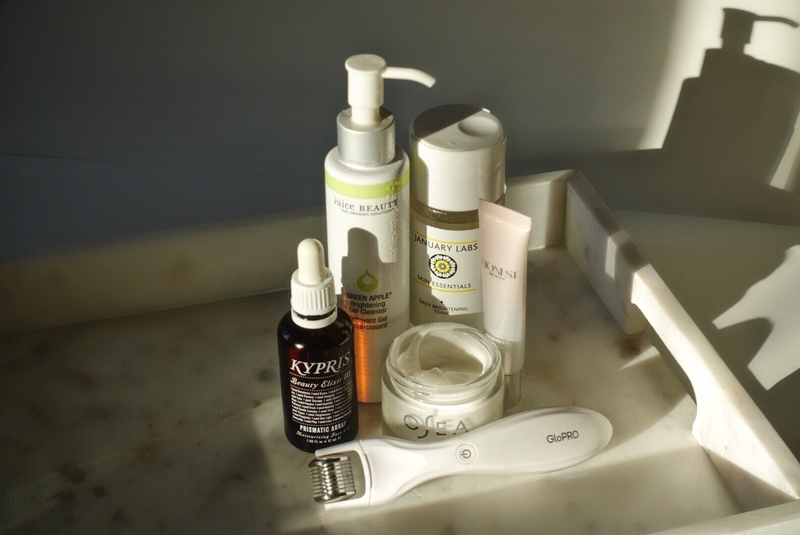 THE ANTI-AGING SKINCARE GUIDE IS HERE! Skin aging starts early in our teens, no matter your age, it’s never too early to start slowing down the negative effects. In this anti-aging guide I will help you prevent and reverse the effects of skin again with my trusty antiaging secrets. I utilize treatments, preventative ingredients, and a specific order of application to achieve plump dewy skin. So what ages our skin? Besides alcohol and Cheetos? There’s a laundry list of culprits including collagen breakdown, sun exposure, dehydration, pollution, a reduction of estrogen, and loss of elastin. My wised up anti-aging skincare strategy was designed to fight these culprits, it relies on four main factors: Treatments, ingredients, order of application, and diligence. -Treatments: We can trick our bodies into building new collagen and elastin fibers by creating minor injury to the skin. Technology has improved to the point where we have option to do these minuscule injury procedures in office or at home and I’ve had good experiences with both. Too be frank, I’m too busy for downtime and I rather spend my money on vacations than procedures, so I’m all about those at home treatments. 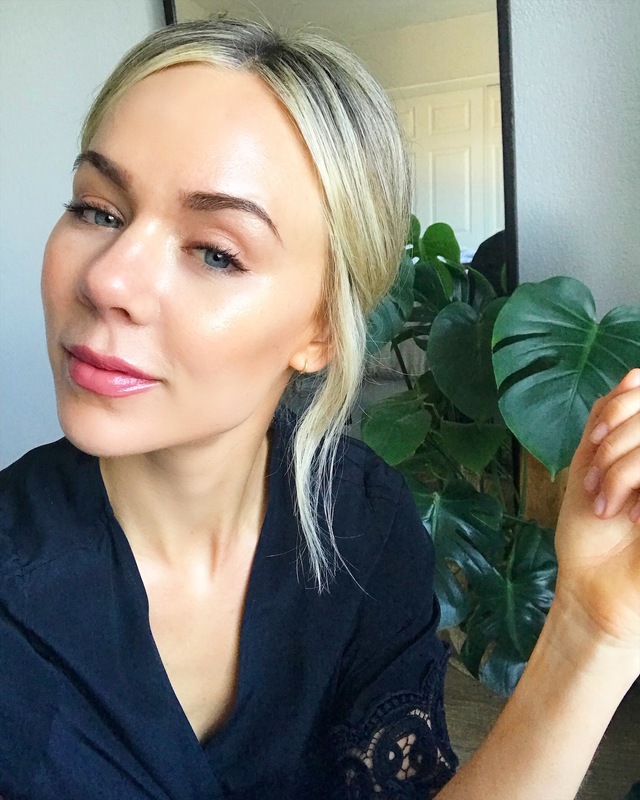 I’ve been loving this at home Glowpro microneedling device from Beauty Bio Science, I’ve been doing my neck and declote twice a week for 3 weeks and I can already see a major improvement in my skin. I’ve omitted my face because it’s bee irritated this winter and you only wanna microneedle on very healthy skin. -Ingredients: This is hugely important. Using high quality plant extracts to chemically exfoliate and hydrate the skin is key to a dewy glow. So many drug store products have alcohols and harsh chemicals that strip the skin. Most cheap products also have silicone to make the skin look hydrated but it really just clogged your pores. 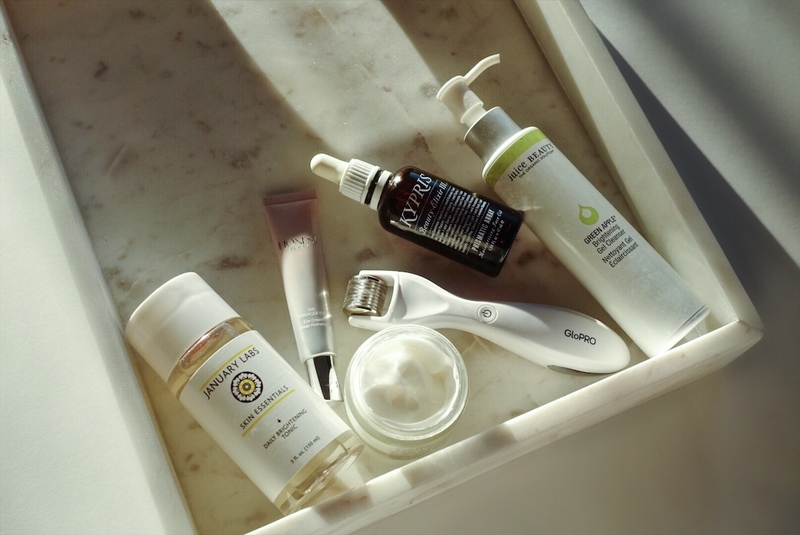 Use nontoxic brands you can trust and your skin will thank you for it. All of my product picks have the highest quality ingredients to make your skin look fresher than a March daisy. 1. Cleansers: Only cleanse with water in the am to avoid drying out your skin. Get all of your makeup off of your face before you wash at night, you can use a makeup wipe or you’re going to want to do a double wash. Once your makeup is off wash in an upward motion to help reverse the effects of gravity. Pick a cleanser that has both hydrating and deep cleaning properties to reveal younger looking skin. 2. Toners: Are a must, to balance PH and chemically exfoliate the skin. You want to chemically exfoliate with toner to increase cell turnover, cleanse pores, and slough dead skin revealing brighter younger looking skin. The watery consistency of toner also acts as a vehicle for your serums to better absorb. 3. Serums: Act as the 1st layer of treatment/moisture, their smaller molecular weight allows them to absorb deep into dehydrated skin. What is life without serum???? It’s a dull, sad, dehydrated life for sure. Vitamin C ester: Non acidic and non-irritating form of the anti-aging Vitamin C powerhouse. Phytonutrients: Feeding skin, leaving it soft and luminous. 4. Eye cream: Is essential because dehydrated eye skin can age you faster than your affinity for soft rock. This second layer of moisture for the most delicate skin on your face needs to be gentle and moisturizing. Hyaluronic acid: To attract moisture and hydrate skin. Barbary fig and baobab fruit, both rich in essential fatty acids. A chamomile and calendula blend: Calms and soothes. 5. Moisturizer: The second layer of treatment/moisture to lock in a healthy glow and protect skin. This step is especially important for aging skin that needs that extra boost of moisture. This step also helps protect against environmental free radicals that can prematurely age skin. Organic Seaweed: Deeply hydrates and firms skin. DPHP: Reduces the appearance of hyperpigmentation. Grapeseed, Jojoba and Avocado oils: minimize the appearance of fine lines. I hope you enjoy loves!! And don’t forget to enter the anti-aging skincare guide giveaway on Instagram! DM me if you have any additional questions! "Benefits of meditative journaling and how to make a Happy List"
TYSM for this amazing article! What do you do for hormonal acne? I was on birth control for 3 months to try it out and I stopped taking it. Now I have the affects left on my skin from an imbalance of my hormones. What can I use to help combat this? I’ve never had this before so I’m definitely in need for some suggestions. I know I’m supposed to do masks after the cleansing step. But should I finish the rest of the steps after doing a mask?or is there a step I should leave out? …. Also, what are your best tips for treating blackheads? I’ve just recently gotten more into skincare, but I haven’t had much luck (yet). Love this post! Every product looks amazing! I wanted to know, how many masks are too many masks? Can I use a mask every night if it’s a different type of mask. Or is it better to give skin some time to breathe and use a mask a couple times a week? Hi! Love this post! I want to try all the products, they look amazing. My question is, how many masks is too many masks to use every week? Can you use a mask each night if it’s a different type of mask or is it better to use just a few masks every couple days to give your skin some time to breathe? I have combination skin and just recently started noticing some pretty severe congestion on my jawline and forehead. Is there anything I can do or any products you would recommend to help get rid of it? If you were to spend money on only one anti-aging, non-invasive cosmetic procedure, what would it be? Hydro-dermabrasion? Chemical peels? Microneedling? There are too many to pick from and they’re all sooooo expensive. Celeste, I notice that you’re combining a lot of different brands, so…Why do you believe/ or not believe that it is important to use one brand’s line? First of all- still so glad that you did an Instagram post on those Hail Merry tarts because I am obsessssed with those! My skincare question is related to the GoPro tool. You mentioned that you haven’t been doing your face because it’s been irritated and I was curious what you would consider “healthy” skin in order to microneedle on the face? Could you still microneedle around the affected area (if you had acne on your chin for example) or would you just wait until the entire face was clear? Secondly, in your Instagram videos it looks like you were using the microneedle tool in multiple directions. Any certain pattern that you should follow or any rule of thumb on how long you should microneedle? Sorry, last question! Do you use the provided pads that come with the tool or do you just wash your face/neck with the Juice Beauty cleanser prior to microneedling? What a fabulous post! What are your thoughts on face oils? I’ve heard so many conflicting things about them. What kind of soaps/lotion do you use on your full body? Also any suggestions on spot treatments? Thanks for all you do! Love your blog!